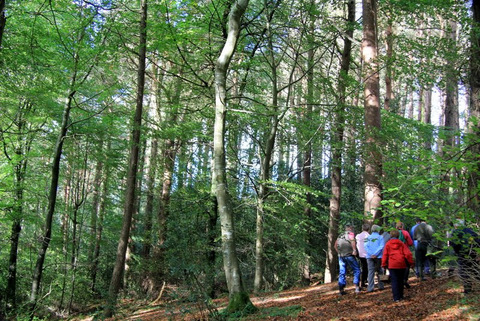 Upcoming April 28th 2012 Open Forest day in South Leitrim – All Welcome! Meeting: Meet at 10.30 AM in the car park of Foxfield RC Church. Please bring your own packed lunch and wet weather clothing and boots. Directions coming from the south, follow the N4 Dublin to Sligo as far as Dromod and turn right onto the R202 towards Enniskillen. Go on R202 (through Mohill) until you reach Fenagh, about 25 Km. Turn left at Fenagh onto the R209 (direction Keshcarrigan), go for about 2 or 3 Km. Church and parking on the left. Follow signs to the Pro Silva Ireland event. Directions from the north, follow the R202 through Ballinamore until you reach Fenagh. Turn right in Fenagh onto the R209 (the Keshcarrigan Road). Go for about 2 or 3 km. Church and parking on the left. Follow signs to the Pro Silva Ireland event. David, Mary and family have a range of forestry plantations all of which are being transformed to CCF. In the morning we will be visiting a high Yield Class stand of Sitka spruce planted in 1990 which to date has received 2 transformation thinnings using the Graduated Density system defined by Talis Kalnars (ProSilva Ireland has a free information booklet to download on Talis’ Close to Nature forest management here. We will be discussing the next steps as the 3rd thinning is imminent. We will also visit a small mixed hardwood stand and another poor quality mixture of Ash and Noble fir. In the afternoon we will visit more broadleaved stands, including a very interesting 4 acre stand of alder and established solely by natural regeneration and a stand of birch established in 2002. We will be discussing the need for early intervention in these stands. We will be joined on the day by Marc Etienne from Prosilva France and by Thomas Vrska from Pro Silva in the Czech Republic. There will be a voluntary cover charge to help cover the costs of our European experts. This will be a fantastic insight into the management of the transformation of recently established plantation forestry into permanent forests. Thank you to all members who have renewed their subscriptions for 2012. For those who have not, your subscription of €40 is now due. Please send this to Pro Silva Ireland, Membership Secretary, 36 Fitzwilliam Square, Dublin 2 or give it to a member of the committee at the Field Day.